Important: Custom Recurring Events has been superseded by Church Content Pro, which does the same things and more (including additional recurrence and exclusion options). It’s easy to Upgrade to Pro if you want to gain the extra features (but it is not a requirement – Custom Recurring Events will continue to work). Thank you for using the Custom Recurring Events add-on. This plugin adds more recurrence options to the Church Content plugin. You can create custom recurrence patterns like “every two weeks” and “every second Thursday”. Use the Upload and Install method to install and activate the plugin. Activate Your License Key to enable one-click updates. When you Activate Your License Key, one-click updates are enabled for the plugin. When a new version is available, a notice will show in Dashboard > Updates (and in Plugins), alongside available updates for other plugins. Read our Updates guide for more information. Note: Church Content Pro provides more recurrence options plus exclusions. You can Upgrade to Pro easily. The Church Content plugin provides has basic recurrence options for events. After activating Custom Recurring Events, when choosing Weekly or Monthly, new options will appear. We’ve made these options as simple as possible while covering a wide range of scenarios. Weekly and Monthly both have an interval option to “Recur Every” X weeks or months. This is useful for setting events to recur bi-weekly, quarterly, every other month, etc. Custom Recurring Events adds the second option. When you choose it, the following choices are presented to you. The day of the week that recurrence happens on will be the same day of the week you choose for Start Date. For example, if the event starts on a Sunday, you can make it recur on the first Sunday of every month. You can use Intervals and Week of Month options together. For example, an event can be set to recur on the first Saturday of every third month. The following translations are included with Custom Recurring Events. If you would like to translate the plugin into another language, read Translating a Plugin. Please contact us if you would like to contribute your translation for the benefit of other churches. Add dismiss/remind notice about Church Content Pro replacing Custom Recurring Events add-on. Require Church Content 1.9 or newer (and start showing update prompt on events screens). Make notice to install/activate Church Content plugin a warning instead of error, and use new classes. 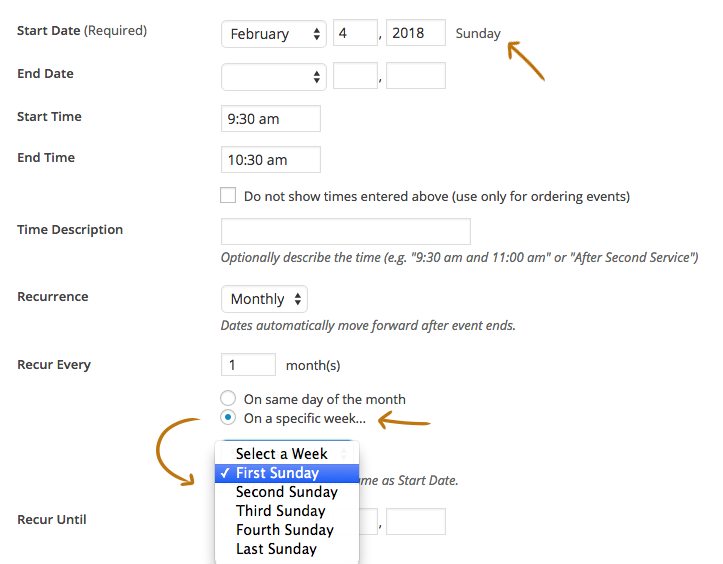 Make monthly recurrence ‘on a specific week’ compatible with Church Content 1.9 datepicker field. Remove check for recurrence field support now that add-on forces support. Remove admin-support.php and notice shown when theme doesn’t support recurrence field; now CRE forces support. Force recurrence support to be enable when CRE installed – even if theme does not support it. Ensure that Custom Recurring Events add-on executes after Church Content plugin is loaded (especially on network installs). Fix: Handle for enqueuing admin events scripts used ctc- prefix instead of ctc-cre- prefix. Remove redundant _ctc_event_recurrence_weekly_interval in support. Add Swedish and French translations. Church Content Plugin Guide – User guide for the plugin that this plugin adds features to. Events Guide – General guide for event features.